Real Name: Godam from Godam land (not human reality), merged with the human Awang. Affiliations: Gundala, Aquanus, Maza, Tira, Merpati, Boga, Kalong, Kartubi, Sembrani, Pangeran Mlaar. Enemies: Roh Setan/Doktor Setan, Sang Kolektor, Bocah Atlantis, G.A.S., Mpu Selamawa, Kucing Merah. 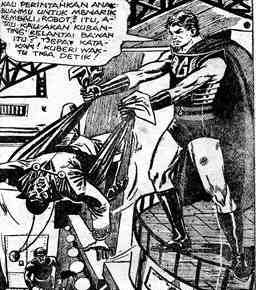 First Appearance: Dr. Setan (Godam series, Kentjana Agung Publishing, 1969). Powers/Abilities: Flying, super strength, invulnerable (can be rendered vulnerable through exposure to the emerald eyes ray of Kucing Merah). 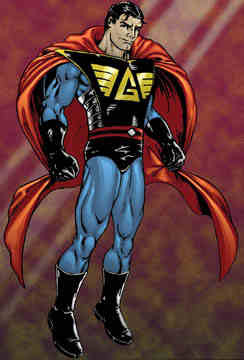 History: Godam was the son of a commander in Godam land, a world under the rule of the tyrannical Queen Chandalani. Godam's father was accused of being a rebel, becoming a fugitive; while trying to escape, he was forced to throw his child into a river, where he was found by the rebel chief Gedibalbanda. Gedibalbanda raised the boy as his son, naming him Godam. After Gedibalbanda was assassinaed Godam undertook a quest to a devilish palace to obtain magical armour; his robe is a magical tribal flag. Godam then dueled and defeated Chandalani's son, who committed suicide afterwards, unable to cope with defeat. Godam was accused of causing his death by Dewi Pengasuh, and punished by being imprisoned within his magic ring. Bapa Kebenaran, the brother of Dewi Pengasuh Sukma, transferred the ring to Earth and chose Awang to be the new host for Godam's spirit. Reincarnated on a new world, Godam became a warrior for justice. Comments: Created by Widodo Noor Slamet a.k.a Wid N.S. Godam means hammer in Indonesian.